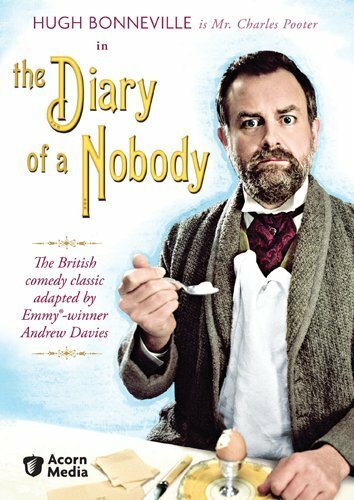 Since Mr. Charles Pooter questions what good is a person's home if they're never in it, it's only fitting that the home of one of literature's most beloved “nobodies,” is where the entirety of director Susanna White's BBC Four adaptation of The Diary of a Nobody takes place. Filmed in 2007, the roughly two hour one man show penned by Bridget Jones' Diary, Pride and Prejudice and Bleak House screenwriter Andrew Davies derives precisely the right blend of humor and pathos from its 1892 source material created by comedian and composer George and his playwright brother Weedon Grossmith. Inspired by the name of their fictitious buffoon whom Acorn Media's press release describes as the same prototype used for the main “lovable twit” characters in works like Fawlty Towers and The Office, "Pooterish" acknowledges a person's tendency to take themselves too seriously. And in this adaptation, Lost in Austen actor Hugh Bonneville embraces his inner Pooter. In translating the diary of misadventures kept by a mid-level city clerk in late Victorian era England, viewers are essentially treated to a four episode one man show by Bonneville that can be viewed in individual installments (recommended) or altogether as a feature length work. Given this approach, other individuals Pooter discusses including his wife, his son William who inexplicably changes his name to Lupin and comedic best friends Mr. Cummings and Mr. Gowings among others never appear onscreen. However, just like in the form of the literary medium, we're able to fill in our own visual representations of the characters based on the anecdotes and tireless recounts of events served up by Pooter. And by giving us the opportunity to experience a diary firsthand (even a fictitious one), Acorn acknowledged that Pooter feels like an earlier version of this generation's confessional bloggers who fill endless space on the internet by revealing everything in great detail regardless of whether or not they're a “somebody” or a “nobody." Thus, Bonneville's Pooter lets us in on his day-to-day struggles to mostly comedic and memorable yet slightly uneven effect. Feeling overwhelmingly staged and perhaps best suited to the theatre or a radio show format, the production benefits nicely when it changes locations from room to room inside his home that's set too close to rumbling train tracks. And again , it works even better, when Pooter does more than just recollect but actually partakes in the activities he's describing such as his impulsive decision to embrace red enamel paint by decorating everything in sight including his bathtub which makes the water red, scaring our lead into thinking he'd ruptured an artery. Admittedly on the whole the tales are so vividly colorful in their detail we don't need a visualization for example when he provides us with the preparation, play-by-play, and postmortem analysis of a disastrous evening at the Mansion House Ball. Still, because we're dealing with a “show me” medium-- while a traditional screenplay with large amounts of dialogue for the characters in moving away from the diary paradigm would've killed it-- the “tell me” aspect we're left with necessitates a new angle since it gets a bit repetitive as it continues. And in my mind, Pooter then begins to feel like a Victorian style Mister Rogers' Neighborhood by sharing mishaps and groaning about his son's romantic life rather than Rogers simply changing his shoes and cardigan. To this extent, I couldn't help wondering if it wouldn't have been even stronger altogether if it had included an actual cast just for background or similar to Tim Curry at the end of Clue or Matthew Broderick in Ferris Bueller's Day Off, if Bonneville had been allowed to just break through the fourth wall and speak directly to us amidst a traditional film scene. While one man shows abound-- adding a postmodern style would've given more life for his Pooter to bounce off of in what feels more like a play that's been recorded rather than a new and unique visual production. Yet, despite the theatrical approach, it's a refreshing and very humorous version of the Grossmith classic that is augmented by a great actor and truly clever behind-the-scenes talent like Davies whom-- by this point-- I'm convinced is capable of adapting any piece of literature you place in front of him.